If you have ever had the chance to contemplate a diamond exposed to the brilliant light of the sun, God’s wonderful, varied, unique, and illuminating Presence can break upon you. GOD IS BEAUTY. Among the numerous attributes we ascribe to God is His marvelous beauty. In fact, the beauty of all creation—the sun, the sky, the clouds, the stars at night, the meadows decked with countless flowers, the majestic mountains in their grandeur and magnificence, the soft and gentle rain fall, the morning dew on the grass, the silent descent of the first snowflakes, the brisk Fall wind—all of these breathtaking images are pale images of the God who is the Creator of all beauty! GOD’S MASTERPIECE OF CREATION. Indeed, God’s beauty is reflected in the world that surrounds us. However, God created a person who is His Eternal Masterpiece. Saint Louis de Montfort, author of the Marian classic True Devotion to Mary, acclaims Mary as God’s Masterpiece of Creation. Call to mind some of the world’s greatest artistic geniuses in painting, sculpture, poetry, writing, or musical composition. Michelangelo, da Vinci, Dante, Shakespeare, Bach, and Beethoven—are among the greatest geniuses in the realm of art and communication. However, God as designer of all beauty has far surpassed all of these geniuses in the creation of this one person—THE BLESSED VIRGIN MARY! Indeed, Saint Louis de Montfort with zeal and enthusiasm acclaims Mary as God’s Masterpiece of Creation!!! For this reason, Saint Thomas Aquinas, the Angelic Doctor, states that God could not have improved on the Incarnation, nor in His creation of the Blessed Virgin Mary! 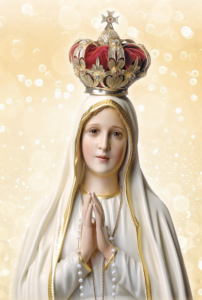 Among the many ways that we can plumb the depths and greatness of this Masterpiece of Creation, the Blessed Virgin Mary, is through the recitation of, as well as meditation upon, the Marian prayer that we title The Litany of the Blessed Virgin Mary. It is a common custom and practice to pray the Litany of the Blessed Virgin Mary at the end or conclusion of the recitation of the most Holy Rosary. However, the Litany of the Blessed Virgin Mary can be prayed at any time, in any place, and in any language. This prayer has many positive fruits or effects in our lives. 1. SEE MARY. We see Mary in her multiple virtues, actions, and gestures. 2. PLEASE MARY. Mary herself rejoices when we pray the Litany to her. 3. KNOW MARY. By praying it, this prayer forms a type of Marian catechesis so that our knowledge of Mary grows. 4. LOVE MARY. The more we get to know Mary, the easier it is to love her as our Queen and our Mother. 5. LOVE JESUS. Mary is never separated from Jesus. On the contrary, the more we get to know and love Mary, the more we get to know and love Jesus! WHAT THEN IS THIS LITANY OF THE BLESSED VIRGIN MARY? There are various Litanies. However, one of the most well-known is the Litany of the Blessed Virgin Mary of Loreto. According to tradition, the home in Nazareth of Jesus, Mary, and Saint Joseph was transported by the power of angels to a Northern town of Italy called Loreto. The above are just a few Litanic expressions of prayer that are part of one of the Litanies to the Blessed Virgin Mary, the Litany of Loreto. The great Marian Father of the Church, Saint Bernard, moved with great and overflowing love for Mary said that with respect to Mary we can never say enough! A SUGGESTION ON THE MARIAN LITANIES FOR YOUR MARIAN ENRICHMENT. First of all, search out for your own self-enrichment A LITANY OF THE BLESSED VIRGIN MARY. There are various and you can choose the one that most appeals to you. Second, print it out or have it handy in your Marian prayer book. For example, if you have the text True Devotion to Mary by Saint Louis de Montfort, the Litany of the Blessed Virgin Mary of Loreto, also called the Litany of Loreto, can be found in the back of the text. Third, find some time or day that you form the habit of praying the Litany of the Blessed Virgin Mary. Perhaps you can choose Saturday which has been traditionally the day of honoring the Blessed Virgin Mary in a special way. Fourth, after the Rosary. Not that this is obligatory, but you might even form the habit of praying the Litany of the Blessed Virgin Mary at the end of your recitation of the most Holy Rosary—a marvelous way to fill Our Lady’s heart with joy! Fifth, when prayed in common, that is with others, in the Church or elsewhere, the Litany of the Blessed Virgin Mary is usually recited at a rather quick pace. However, with respect to your own private time of prayer, it could be an inspiring practice for you to spend a longer period of time praying and meditating upon the different phrases in the Litany. Many of these phrases are Biblical, others are mystical, and still others are beautiful expressions of poetic imagery, inspiring to say the least! Then after your prayer, take one of the phrases that seemed to have touched you the most and stay with it during the course of the day. Walk with Mary in her holiness and beauty, like taking a rose with you during the course of your daily activities. Indeed, one of the many striking titles of Mary is that of the Mystical Rose! May the frequent recitation of the Litany of the Blessed Virgin Mary serve as a beautiful and glimmering diamond that you contemplate with the eyes of your soul frequently so as to transform your mundane existence into a constant heavenly fragrance and aroma!